a feminine equivalent to that analogy?… but let’s not get sidetracked—or would that be side-saddled?). Over the years I’ve noticed a recurring pattern where artists seldom have a conscious, intentional relationship to their art. It’s more like the relationship is taken for granted, because, after all, the act of making art itself is already a relationship. And it’s usually a relationship that engages you in ways that are pleasurable and satisfying, neither of which seems to excite our brains or psyches to dig any deeper. This is usually not a pleasurable or satisfying question because, most often, the only response that comes out is vague or banal or downright trite with shopworn words like beauty and inspired and colorful and light, etc. There can also be an underlying irritation that goes something like (silently to self) Why can’t so and so just look at my work (and be satisfied as I am)? Satisfaction is a response to a relationship. The person who asks you this question is also at a loss for hidden questions lingering underneath this obvious one, which is a lot like the way we all ease into a conversation with each other – with small talk about the weather, or the fabulous lunch we just had. Small talk, contrary to commonly held views, is only shallow when it exceeds its original intention (which is to ease us into deeper waters with each other), or when it becomes the whole conversation. Likewise, when someone asks you what your work is about, that’s the easing into deeper waters about your relationship to your art, which is another way of asking about your relationship to creativity, which is another way of asking for help with their own creativity (or perceived lack of). Of course, beauty may be a driving force for you as an artist, and that’s legit. What’s not okay is to be lazy about digging deeper into what beauty is for you so what you talk about has real impact—as much of an impact as your art. Because, what you say or don’t say about your relationship to your work affects your work. And, yes, I understand that even though you spend hours every single day immersed in the language of words, somehow bringing conscious attention to your own word-language seems fraught with problems, resistance, and downright denial of language as your medium of expression. 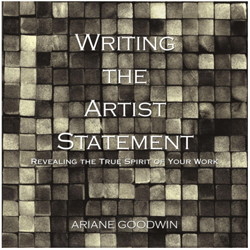 I talk about why this happens to artists in my book, Writing The Artist Statement: Revealing the True Spirit of Your Work, and essentially it boils down to a long-held prejudice that was instilled in us by years of elementary, junior-high, and high school regiments of when, where, and how we were allowed to say what to whom. And the consequences of being shamed, rebuked, and dismissed if we didn’t comply. Fast forward to adulthood, and now words are wrenched from the pit of how we have been separated from one of our most natural forms of expression, and one where we don’t have trouble until we are asked to write or speak intentionally. Like anything else you want to master, choosing the words that most truly reflect your relationship to your art takes practice, the bravery to ask others for feedback, and more practice. 1. Focus on your relationship to your art instead of explaining your art. 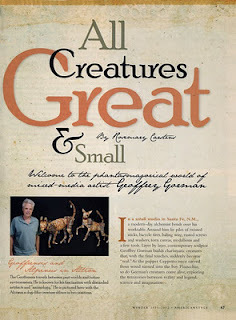 When you try to explain your art you are stepping into the critic’s shoes, and they will invariably pinch your toes. Invite people into your world of art making, which is what they really want. Why do you do what you do? How do you do it? Why do you use those materials and not something else? Describe what you experience as you are creating. Describe the idea that drives you to make the next mark, shape the next hunk of clay, fire the next tile. 2. You are talking to your self about your art all the time. It’s what I call wallpaper talk. You don’t pay any attention to it. It’s just there. If you start carrying around a notebook, in the studio, in the car, by your bed… and simply jot down EVERY THOUGHT about your work that comes into your head, yes, even the dull, the boring, or the outrageous and unrepeatable. This puts your brain on alert that this self-talk is no longer wallpaper and it will reward you with unbelievable gems down the road. Write this question: “What do I mean by beauty?” Then answer it. And if another common phrase jumps up, do it again: “What do I mean by light?” Then answer that. Eventually, you’ll come to a place that transcends your own expectations. Note: Do this when you will absolutely not be interrupted. And light a candle while you Q&A with yourself. btw – Geoffrey and I ran a fabulous 10-week course called “The Art Career Mentor Program” where we pulled together a complete course on putting your art career on the map. Then we turned the live course into a Home Study Course, so you can set your own pace. 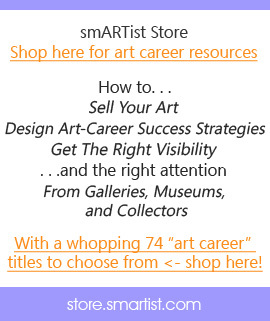 The Art Career Master Vision Plan, in sessions two and three, helped me re-vision what I want to do, looking at what my current business practices are, where they fall short, and what I can add that is consistent with my vision. This program helped me take an honest look at where I am, what I’m doing now, and jumped me out of a marketing and creative rut to take more control of my path. Hmmm. This confidence series is interesting. I especially like No. 1, the why you do what you do. It used to be that anxiety drove me to draw and to sing. I would hum on the school bus. Memorize tv show theme songs. When I drew, there was something in there that had to get out and I didn’t want to stop until it came out. I used whatever I had available. Now, I’ve learned that it’s better to use a few different pencils than just one for a better tonal range, but thinking about the technically correct way to create art kind of eliminates the fun of it for me. I haven’t really made art since 2004. Not sure why. I’ve got excuses, but you say you don’t buy them, like the one about no space to work. Rent a studio? No money. I’m negative on myself, so it takes someone’s positive encouragement to bring me beyond the dungeon of my bad attitude. Your series seems to be shining a flashlight into my cell and makes me wonder if there’s a chance I can get out. It’s like the movie Inception. Can anyone pull me out of my bad dream? Hey Mark, what a brave comment – you take my breath away, truly. And what if being this open with what’s real for you is the beginning of you reconnecting to another truth, one that has been playing in the shadows of your fear–the truth of your love for your creative essence. What if you gave that a chance to show up in front of the anxiety, to offer you the ball of twine so you can follow your own heart out of the labyrinth and leave the minotaur to his own devices in the dungeon. No battle here. Nothing to overcome. Just a new choice. Oh yes, I’d love to just live to create art and learn art techniques. I bought an encyclopedia of artistic techniques once. It’s packed away somewhere along with lots of art books. I’ve been out of work for over a year. Out of unemployment benefits. I just have to do what I can. I can’t afford to start out in the basement of learning to create and sell art. People say to start out on the side. I could if I had the main activity–a job! But when I get a job, I’ll usually find an excuse not to have enough time for art . . . I can imagine winning some contest where I get enough money to just experiment and dabble in art until I get something valuable going. That isn’t reality, but it would be fun! Seems to be a good subject, the looking beneath the surface to help joe public understand what your art means to you. As an artist it is very easy to be involved in the painting process with the commercial aspesct nipping at your heals, that after a while the image of why and what your art is becomes blurred, and notes likes this one of yours helps to bring back into focus what is important and to be more sensitive to others in thier inquisiitive nature, since when they look at our art they are connecting greatly and as you say all sorts of questions come up. I missed part I but must have been a good beginning to part II. Thank you. I agree that daily life “nipping at our heels” (love that image!) tends to distract us from our deeper connections. So I’m grateful to hear that this confidence conversation is refocusing the attention. Interesting idea! Just reading this article gave me some surprising answers to the question of why I paint what I do in the mediums I use. Thanks for helping me put together a coherent artist’s statement. I’ve put that off for a long time, but today my writing and my art came together. Wow! Now that really put a smile on my face! I really appreciate you letting me know because Artist Statements are where this all started for me!